Peter Comestor's Historia Scholastica is a history of the world, based on the Bible from Genesis to the Acts of the Apostles. This manuscript contains just the Gospels part. It was owned by the Augustinian priory of St. Mary Overy (i.e. St. Mary over the river), Southwark, on the south bank of the Thames in London. 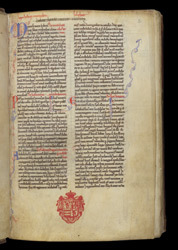 The first page of the text has an effaced ownership inscription of St. Mary's Overey in the upper margin: 'Liber beate Marie Overey'.